London Art Fair 2012 contained over 100 galleries featuring the great names of 20th century British art and exceptional contemporary work from leading figures and emerging talent. There were solo shows and curated group displays in Art Projects section, with galleries drawn from across the world, while Photo50 was a showcase for contemporary photography. This year’s fair is labelled as offering a taste of ‘Passion’, especially for art investors as interest rates - a prime factor for investment in the art market - is now said to stand at 20%. 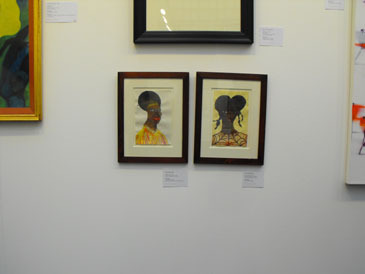 There were high quality pieces from the likes of Chris Ofili the Black British artist who currently lives in Port of Spain, Trinidad and Tobago. Other art pieces included ‘Ghost of a Dream’ by the American artist Adam Eckstorm, whose optimistic primary materials played on the impact of the Cultural Olympiad. Among the important exhibition was “the heart rules the head”, which was placed at Crane Kalman Gallery, that is representing Ofili. There were also lots of papier-mâché elephants in Yorkshire’s Bridlington take on the old stomping ground of David Hockney and the vibrant colours of the Yorkshire’s West Indian communities. Juliette Ingrid Goddard is an artist and a graduate of the Royal College of Art.